The 2010 outbreak of Cholera in Haiti has sparked a debate about water quality in the Caribbean nation. Cholera is an infection that spreads through contaminated food or water. Haiti's water supply is one of the worst in the world. In fact, it ranks last in the Water Poverty Index, a list of countries that experience a lack of fresh water. There are 147 nations in the index, and Haiti is 147th. If Haiti had access to clean water, the cholera outbreak that claimed 6,000 lives might have been avoided. The epidemic highlights the dire need for the international community's participation in helping Haiti recover. This means joining the fight to provide the people of Haiti with clean, drinkable water. Many poor nations still suffer without potable water, but the cholera problem compels us to address nations most in need right now. Sign the petition asking the UN to dedicate more time and resources toward providing clean water to Haiti. 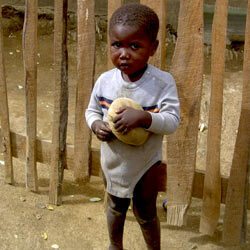 I am deeply concerned about the wellbeing of Haiti in this time of disease and struggle. The 2010 earthquake in Haiti has caused many multi-faceted problems for the Caribbean nation, and an outbreak of the deadly disease cholera only exacerbated Haiti's problems. It claimed 6,000. Cholera is so dangerous because it can cause death within hours of contraction. Water is a prime concern with regards to controlling the outbreak, not only because it was most likely contaminated water that caused the epidemic, but also because the infection causes severe dehydration due to diarrhea and vomiting. Cholera patients need to have access to clean water if they are to have a chance of survival. Unfortunately, potable water is a rare commodity in Haiti. Clean water for Haiti means empowering the Haitian government to regulate their own private water sector. It means keeping close track of the water that Haiti consumes, and making sure it's reaching the most impoverished citizens. I am writing to ask that you do all that's within your power to ensure clean water is being routed to Haiti. Millions of lives depend on this natural resource, and we have the power to help. That's 15,601 signatures! Let's keep the ball rolling.